Carrying patients on canvas stretchers and guiding ambulances through London's so-called pea-soup smogs are some of the most memorable memories held by one of the oldest ambulance driver retirees. Ron Ellis began working on ambulances as a teenager and worked in London throughout the Blitz and the capital's deathly smogs. Mr Ellis is due to celebrate his 100th birthday weeks after the NHS turns 70. 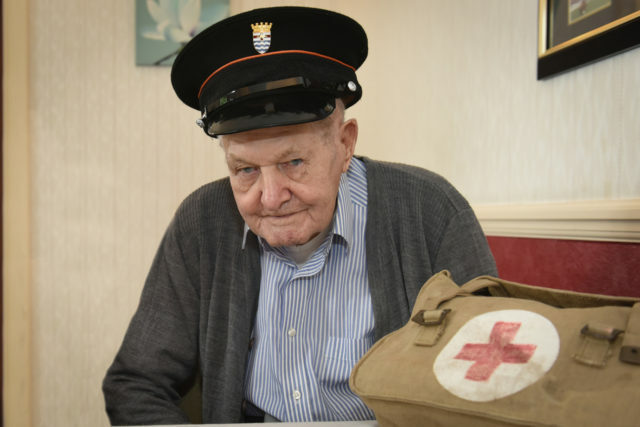 The 99-year-old, from Enfield, north London, started his career in the 1930s - when the local government was responsible for the running of ambulances. Ambulances at the time were equipped with canvas stretchers and came with a bell rather than a siren. He recalled walking in front of ambulances carrying the bell and a torch so the vehicle could be seen in pea-soupers - fogs caused by air pollution which historically plagued the capital. "I once walked in front of the ambulance from the Prince of Wales Hospital in Tottenham to Chase Farm Hospital in Enfield," he said. He continued: "It was a hard job then. The ambulances didn't have ramps so it wasn't always easy carrying our patients. "But we had a lot of fun. They were the best days of my life. We worked hard but got by with a good sense of humour." Ron - who will become a centenarian on August 27 - met his wife Gladys, a nurse, while working. Now widowed, Mr Ellis, from Edmonton in north London, lives in a care home close to where he grew up. While regaling stories of his career, he prefers to talk about happier memories - such as delivering babies - and prefers not to discuss the Blitz during the Second World War. "I delivered a lot of babies," he said. "One was a baby girl born to an Italian woman. That baby girl grew up and wrote to me. I will never forget that." When Ron started working, the ambulances came under the control of London County Council. He was still driving when the National Health Service was created in 1948. He left the job in 1965 - the same year London Ambulance Service was created. June Haydon, manager of Green Trees Care Home where Mr Ellis lives, said: "Ron is wonderful. Working on the ambulances wasn't a job for him. It was dedication. "I spent a long time working for the NHS and I can relate to a lot of his stories. But what it comes down to is his dedication." London Ambulance Service said that the role of an ambulance driver in Mr Ellis' time is very different to the paramedics and technicians working today. Mr Ellis had a few bandages and drugs on board, but rarely treated patients - his main role was to take the dozens of patients he would see each day and quickly transport them to hospital. Now medics working for London Ambulance Service carry life-saving kit including defibrillators, and many have a degree in paramedic science. When Ron began his job, only men worked on ambulances. Now around half of London Ambulance Service's staff are women. Mr Ellis wore a blue wool uniform with matching cap, while ambulance staff today wear green.